That's adorable - thanks so much for thinking of me! Thank you! That's so sweet of you, you just made my day! Wow, you changed your blog! it looks fab, where have I been lately, I know hanging with faeries! Thank you so much for the award, it is so cool!!! Thanks SO much for the award Carrie. 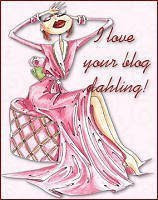 I have added it to my blog as a clickable link back to you in my sidebar! You are so welcome and so deserve this award...Hey, what's up with the birds signing...LOL Very cool indeed...hehehehe Have a great Sunday. Congrats on the award and thank you, Carrie! I am far behind, but will be posting about the award soon.